Jailbreaking iOS devices opens it up to a whole new world of apps and tweaks that let you customize your device to make it look and work the way you want it (and not how those folks up at Cupertino decide it to). While there plenty of game-changing apps/tweaks out there, I feel that it’s the smaller ones – the one-trick ponies that change the way how one small aspect of your device looks/works like – that make things better. We’ll be talking about a one such tweak today. It’s called Swipe for Mail and it lets you swipe left and right on emails in Mail.app to go to previous or next email. Check it out after the jump! Swipe for Mail adds the ability to swipe left or right in Mail.app to retrieve the previous or next email. No icons is added to your home screen or settings. There are no options to configure. We’ve tested the tweak on a jailbroken iPhone 4S on iOS 5.0.1 and can confirm that it works as advertised. It’s a very small but useful tweak which makes reading emails a more pleasant experience, at least for us. This tweak, of course, isn’t suited for those of you who prefer tapping buttons rather than using gestures. 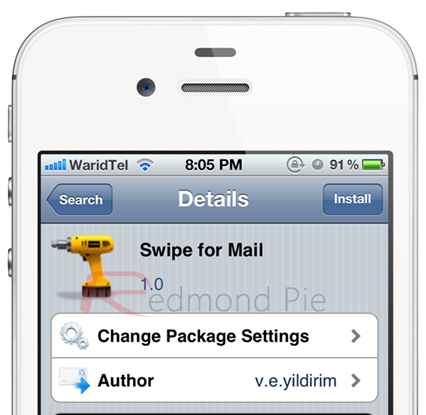 Swipe for Mail can be downloaded for free from Cydia under ModMyi repo (which is included by default unless you’ve removed it for some reason). Don’t forget to let us know what you think of Swipe for Mail in the comments section over on our Facebook and Google+ page!